If you’re looking to make some simple changes to help you and your family eat more healthily day to day, look no further than our FREE five week cookery clubs. Cookery Clubs are a great way to learn how to cook meals that are quick, healthy, delicious, and low-cost. Our friendly, qualified tutors offer great advice on eating a healthy, balanced diet by making small changes that make a big difference to your health – all while keeping within your budget. 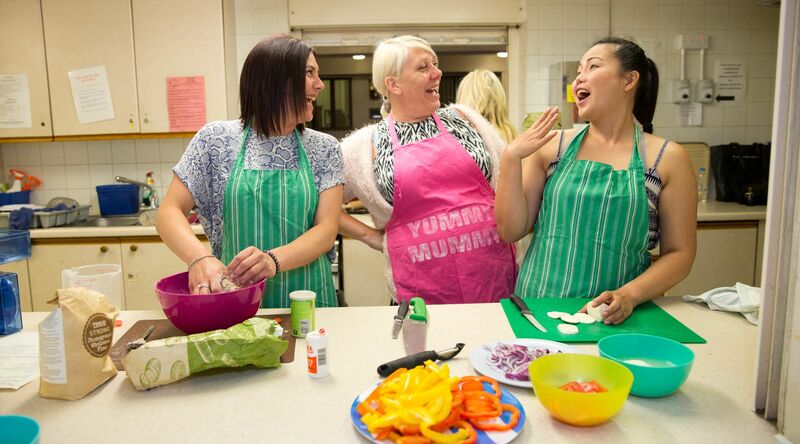 Find a community cookery club near you. From measuring your salt and oil to help you control the amount you use, to finding easy and inexpensive ways to up your intake of fruit and veg. You’ll find lots of useful tips and ideas to help you eat well, reduce waste, and save you money, with the chance to pick up some practical cookery skills along the way. An ever popular element of the course, our cookery clubs also include a week dedicated to food growing. You’ll learn about herbs used in cooking and for health, and how to grow your own herbs and salads in the smallest of spaces in and around your home! Courses are open to everyone, from complete beginners to those who are a dab hand in the kitchen. All ingredients, equipment and aprons are provided and you’ll also receive a free recipe book when you complete the course, featuring recipes prepared during your sessions. Sessions take place once a week, last two and a half hours and run from 14th January to 11th February. For further information, or to book a place, visit the Cookery Club website or contact us on 0800 470 4831. But hurry – places are filling up fast!